Discussion in 'Model X: Ordering, Production, Delivery' started by modelx007, Dec 4, 2015. It is my understanding this comes automatically and is a 1.2 hitch. Which means you should be able to get an accessory such as this Hitch Cargo Rack | StowAway2.com ? Vs buying the 2" hitch which requires air suspension. And it is my understanding that the accessory hitch is a no cost option, but you still have to choose the option if you want it. I got the 2". I already have the 2" cargo box of that ... plus I may tow a jet ski or something in the future. Any StowAway2 owners wondering about range impact on Model X? 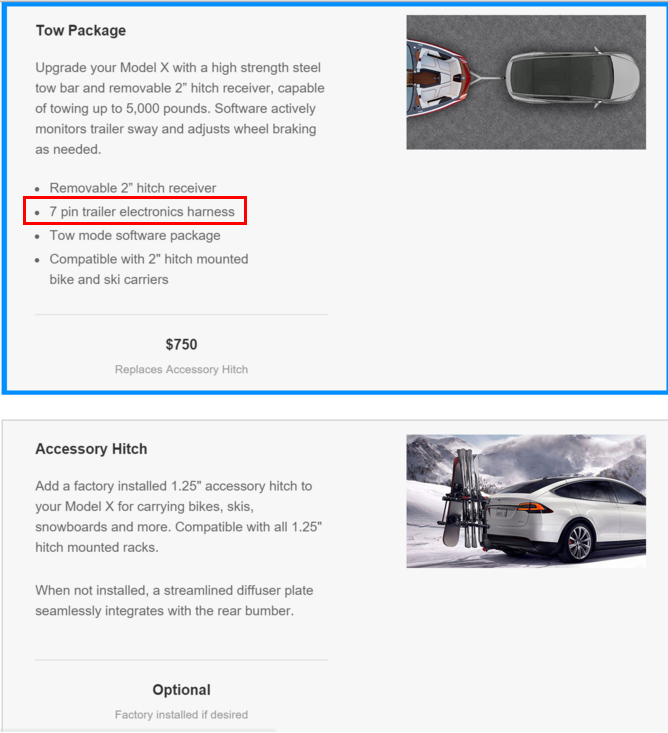 So is it better to spend the money on 2" hitch with model x even though I'm sure I won't be pulling a trailer but will be using it for cargo carrier? What are you going to carry? Will you want a bigger carrier that may somewhat cover up the brake lights and thus have built in brake lights itself (like my cargo box). 2" comes with hitch plug for brake lights. I don't know if the accessory hitch is class 1 or 2 and what weight it would then allow. Would someone post when they find out if the 1.25" accessory hitch is class I or class II?